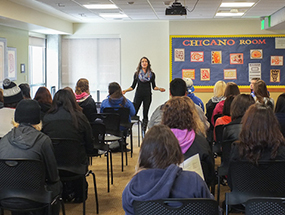 Students from Granger, Toppenish, White Swan and Wapato High Schools visit the UW Law Academy in March 2015. The Educational Talent Search mission is to promote opportunities for those seeking to pursue higher education and to provide educational support services to limited-income and first-generation, college bound students in eight participating school districts in Skagit, Snohomish and Yakima counties. This spring the UW Educational Talent Search team took ETS students on field trips to different post-secondary institutions across Washington. Students had the opportunity to attend admissions presentations, tour campus, dine in dorm cafeterias and question current university students to learn more about college life and experience. The ETS staff assists in providing mainstream educational opportunities to students in participating schools from income eligible backgrounds and/or potential first-generation students to complete secondary education and enroll in post-secondary institutions.